EBusLim is based on a limiter mode from Voxengo's Elephant. 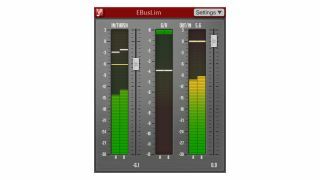 Redoubtable plugin developer Voxengo has released EBusLim, a brickwall peak limiter and loudness maximizer. This offers a single EL-4-based limited mode that was originally designed for the Elephant mastering limiter plugin, and is suitable for bus, drum bus, master bus and track processing. Voxengo says that the idea was to create an easy-to-use but effective limiter - it's available in VST/AU formats for PC and Mac priced at $79.95 (currently $67.95 thank to Voxengo's summer sale). You can find out more and download a demo at the Voxengo website.